Malgosia Kiernozycka was born in Wroclaw, Poland. She graduated high school at the School of Fine Arts and received a scholarship from the Minister of Culture and Art for the University of Fine Arts in Wroclaw. She studied glass design under Prof Witkowski and painting under Prof Wanda Golkowska. She received her master’s degree along with an award. In 1986 she moved to Germany and studied screen design at the Multimedia Academy in Mainz, and worked as guest speaker at the Academy of Fine Arts in Wiesbaden. In 1989 she participated in an art exhibition for the best Diploma works in Munich, Germany, and was invited to present her pieces at an exhibition in Osaka, Japan, due to her outstanding work. 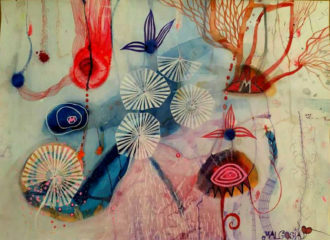 In 1990 she was a laureate at OB ART in Paris where she showcased her glass works. She’s worked as a graphic designer, painter, and on various other digital projects for many years before stepping away from art for a while. Only in the past few years did she come back to painting and drawing. 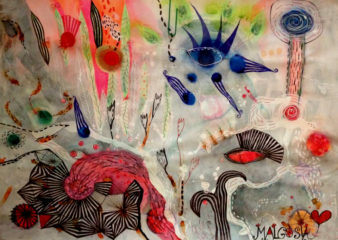 Now Malgosia spends every free minute on her artistic work, playing with colors and formats, exploring and evolving her style. 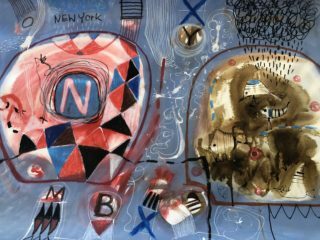 She creates stories with lines, circles, and blotches on paper and canvas while drawing inspiration from walks through Berlin, graffiti and street art on the walls and gates, colorful streets, as well as music and movies. 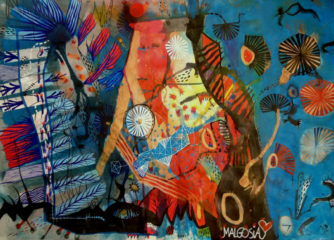 Malgosia also participated in many groups and individual exhibitions around the world: Moscow, Russia – best youth diploma Koszalin, Poland – group open-air exhibition Grün Berg, Poland – individual exhibition at the city gallery Grün Berg, Poland – individual exhibition at the pedagogical University gallery Wroclaw, Poland – group exhibition for students and professors Munich, Germany – youth designs Munich, Germany – Regina Haus – Art Week Winkel, Austria – WIR 3 group exhibition Eltwille, Germany – group exhibition at the town hall Nimes, France – Art fair Kassel, Germany – Dokumenta – group presentation Paris, France – OB Art – Art fair – 1st prize Paris, France – exhibition at Lafayette Gallery Malgosia Kiernozycka’s works can be found in individual as well as group collections around the words, at the Capazza gallery, city gallery in Strasburg, France, New York, Florida, Australia, Germany, and Poland.